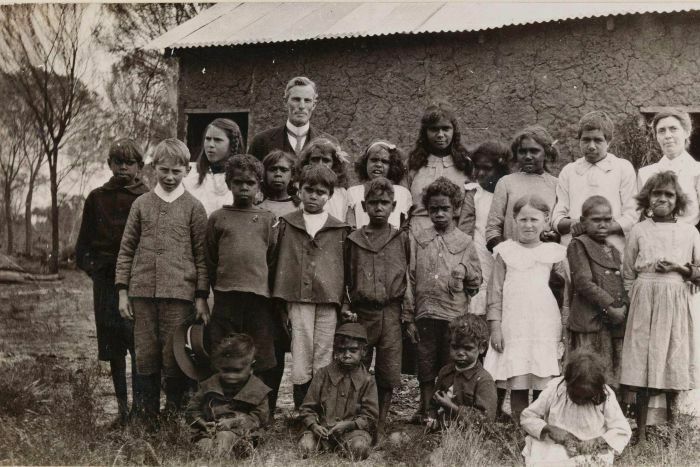 Children of Carrolup with the first superintendent Mr W. J. Freyer. He was forced to resign in 1918 for chaining one of the young girls by her neck to a bed as a punishment. This is the third of a series of blogs that considers the social, political and cultural context existing prior to our story of the Aboriginal child artists of Carrolup. I focus on the policy of removing Aboriginal people from their families, which resulted in what we now know as The Stolen Generations. Sections are taken from our forthcoming book. Mr Auber Octavius Neville was Chief Protector of Aborigines between 1915 and 1940, initially working under the Department of Aborigines and Fisheries. He was a bureaucrat of great determination who devoted his talents and energies to tackling what he perceived as an emerging racial problem in Australia. He did not just exert a profound influence on policy and practice on Aboriginal affairs in Western Australia, but also influenced related policy across the country. Today, ‘Neville the Devil’ is remembered by Aboriginal people more than any other white person as being responsible for the tyrannical control that was exerted over Aboriginal people. Neville’s appointment as Chief Protector resulted in a period of strict implementation of the 1905 Aborigines Act and unprecedented interference in the lives of Aboriginal people, particularly in the South West of Western Australia. In the early years of his position (1915 – 1920), Neville focused on the development of the government-run ‘native settlements’ at Carrolup and Moore River. The idea of these settlements was to isolate Aboriginal children from their parents, then educate and train them for unskilled occupations, e.g. domestic service and farm work. These settlements would not only serve the purpose of giving Aboriginal children the ‘opportunity’ to shed their Aboriginal background, but would also appease white communities who did not want Aboriginal people camped on the edges of towns. Another important aim was for these settlements to be developed with the minimum amount of government expenditure, which is what happened. The settlements became places that had shocking living conditions, harsh controls and cruel punishments. During his time as Chief Protector, Neville became increasingly concerned about Aboriginal people of mixed descent, particularly those in the South West. He felt that ‘full-bloods’ should be left alone and no attempts made to civilise them, although provision should be made for their physical comfort. He believed that they would die out in due course, despite having no evidence for this view. His views were stated clearly to delegates from around the country in the Initial Conference of Commonwealth and State Aboriginal Authorities in 1937. Neville stoked the fire of fear at this conference, and made clear his view of the future for Aboriginal people in Australia. Some Aboriginal girls were raped by white people when in service, returned to a government settlement to give birth, and then had the child taken away. They would then be sent back into service. Neville introduced and maintained his policies against Aboriginal people despite knowing that they hated being institutionalised, and that they had a tremendous affection for their children. The picture that Neville painted about what was happening to Aboriginal people in Western Australia was often different to the reality. There was no evidence for the last line of the above statement. Aboriginal mothers were devastated by the loss of their children, and many spent the rest of their lives trying to find them. Of course, Mr Neville was not solely responsible for these policies. He was acting in accord with government policies, which were strongly supported by many white people. In fact, an increasing prejudice towards Aboriginal people from the first decade of the 20th century, particularly in the South West, had resulted in calls for them to be excluded from contact with white society.